There are certain operas in the canon that mysteriously need nothing else except their music to successfully compel audiences. As one of the most consistently performed since its (fifth) revision, Puccini’s Madama Butterfly certainly ranks within this selection— however ironically since operas are by nature more than "just music." 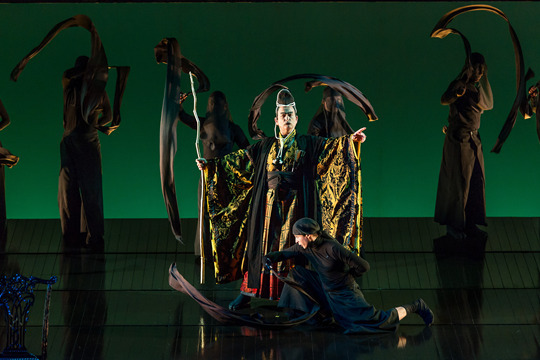 Butterfly as it appears at ENO is nevertheless couched in a purposely-beautiful Asian Fusion production designed by the late Anthony Minghella (now an audience favorite shared with the Metropolitan in New York), and one that takes the opera’s occasionally latent anti-American sentiments to new heights. These associations seemed less overt in 2009 but play quite strongly these days, perhaps most notably during Act III before Butterfly’s suicide, when Sorrow enters waving an American flag. 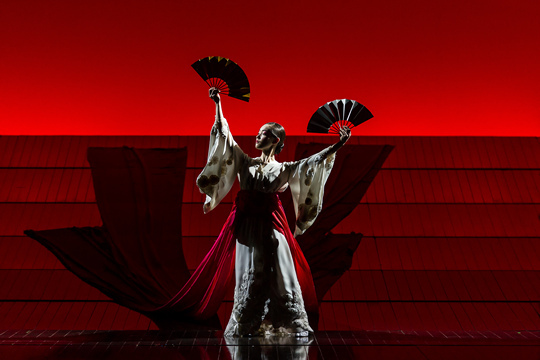 Madama Butterfly is an unquestionably Orientalist work because the opera intersects a web of stereotypes musically and visually. It would not be difficult to position this production as simply another product of Orientalist discourse: its incorporation of "Eastern" imagery and focus on Americana propagates the racist and imperialist mentality of the past anew. On the other (less cynical) hand, the production’s appropriation of traditional Japanese arts such as Banraku puppet theatre give the performance considerable recuperative value, especially with the anti-American spin. David Parry’s English translation contributes greatly to this effect and overall it’s a well-taken message, especially as America withdraws from a ten year war that can be understood—and is by many—as imperialistic. Thus the beauty of the production both contrasts sharply and enhances the music’s sinister undertones, and the performers teased these conflicting associations out expertly. Butterfly is a notoriously difficult role to sing yet Mary Plazas makes it look easy. All the key moments (the love duet in Act I; the revelation of Sorrow in Act II; and both arias) were sung with passion, commitment, and a soaring clarion tone. Her entrance was shaky, however, but it’s a lengthy opera that requires much stamina. Plazas is not only a singer that transports with ease but also a truly moving actress; her face was the perfect mixture of hope, exasperation, and naivety as she waited with Suzuki and Sorrow for Pinkerton at the end of Act II. It was an unforgettable portrayal. Equally moving but on a somewhat different level was Pamela Helen Stephen, who was a resounding and loyal Suzuki throughout but most captivating in Act III, where she sang with verve and superior conviction. Gwyn Hughes Jones was committed to his music from the beginning; it’s refreshing to hear a tenor sing with the panache required to really make Puccini successful. There were a few overpowering moments from the orchestra during his first act aria (here translated as "The world’s my oyster"), and he might’ve given the sound a bit more spin. John Fanning was a formidable Sharpless; his diction was impeccable and his acting convincing, especially his "I told you so" lines at the end of Act III. Michael Colvin was a slightly sterile Goro, but his manufactured naggings were a source of both comedy and entertainment. The chorus (which strangely did not receive a curtain call) sang a fantastic rendition of the Humming Chorus (Act II), but was less precise during their Act I entrances and exits: the blend was poor and the conviction lacking. One wishes in vain for Oleg Caetani to conduct more opera: his tempi are superb and perfectly selected for our modern tastes (expansive Puccini), whilst his focus on the atmospheric episodes of the score evoke compelling images of Western industrialism and arrogance on the rampage (fitting perfectly with the recuperative message of the production). The supporting characters sang with less verve than the principles, and distracted from what was overall a meaningful triumph for ENO.